Product information "DD ExpandIO 19" Server 4U - 6x PCIe Gen 2.0 Expander / Backplane"
Reward with the "Industrial award 2018 - BEST OF"
... offers enough space for 7 expansion cards* directly on the motherboard** plus the additional six PCIe slots of the ExpandIO. It supports ATX PS/2 power supplies and has 2x USB 2.0 front connectors, as well 2x internal 3.5 "inch bays The form factor of the 19" case is 4U. 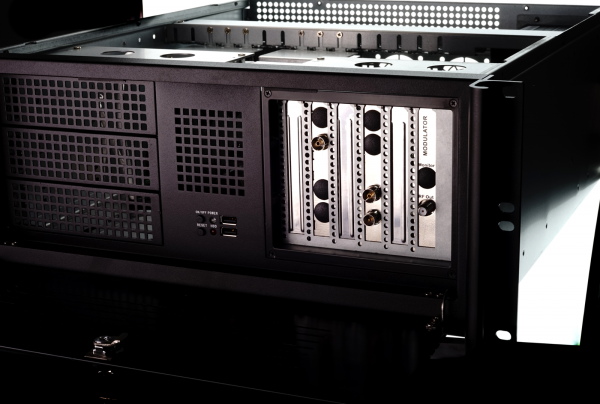 To use the ExpandIO backplane, the PCIe host controller is plugged into a free PCIe x8 slot on the installed motherboard, which performs the distribution on the backplane. The expansion of the PCIe slot is not limited to Digital Devices hardware, but PCIe slot cards from any manufacturer can be used. For the use of Digital Devices hardware, the construction of high-density streaming servers or IP head stations is now possible without the purchase of expensive motherboards, which had to have a large number of PCIe slots for as many tuners. With our Max series, which already provides you with 8 tuners per card, you can expand a single PCIe slot for up to 48 tuners. The shown case may differ from the pictures. Related links to "DD ExpandIO 19" Server 4U - 6x PCIe Gen 2.0 Expander / Backplane"